A collection of thoughts, mind games, and observations made while running, thinking about running, or doing any alternatives to running. If you're wondering why I haven't been posting many updates and telling all my stories... well, the truth is, I'm kind of afraid to. I'm afraid to even say this out loud, but for the first time in a long time, nothing is wrong! After my Disney race last month I decided it was time to go big. It's been a while since my last marathon (Boston, 2014) and I figured it's time for a new challenge. Mentally I was ready to sign up for another marathon, but I decided that this time around I was going to select a race that really suited me. My previous marathons have been races that I signed up for to run with friends, and although I'm glad I did them, none of them really suited my personality or allowed me to do my best. Sometimes I think people get so caught up in the hype of a certain race that they don't consider whether it's a smart choice for them personally. So, this time I focused on thinking about my past marathons and other long distance events, and what worked for me and what didn't. When I pulled it all together, I realized a very common theme. I don't like people. Okay, well that's not 100% true. But more specifically, I don't like the big crowds, endless cheering spectators, and complicated logistics of races. For example, sure I love Disney. But I don't love running a 12 minute mile because I can't get around people, or having to walk 45 minutes to the start line at 5am and having sore feet before the race even started. For Boston, of course I love Boston. But the start/finish line logistics and endless spectators exhaust me, not to mention the anxiety that I will always have at that marathon. All of this makes sense since I'm an introvert, and naturally exhausted by crowds of people. 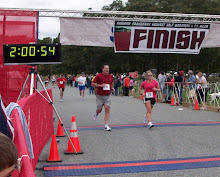 I also thought back to the Patriot Half Iron I did last year. When I had to start running my half marathon 4 hours into my race, I was shocked at how good I felt. Despite having already swam 1.2 miles and biked 56 miles, I was happy and strong. The course was on quiet, rural roads with very little traffic and just a few friendly faces sprinkled throughout the course. No screaming, drunken college kids. Just an occasional property owner cheering me on. I felt like I was running in my own town, and it was perfect. When I finally put all the pieces together, it finally clicked. Why not run another marathon in the same place I started my running career: Hyannis! I've had such a love affair with Hyannis for years. It's where I ran my very first race (a 10k), and where I PR'd my half marathon. I even went just to spectate the year I had my hip surgery. I like this course because it's quiet, on small country cape roads in cool weather. I debated whether doing a two loop course would be too much torture, but I think I can handle it. I'm excited to have some friends there doing the half marathon, that will be there to cheer me on when I pass through at the halfway mark and again at the finish. When I visualize this in my head, it just feels right. Plus, I love that I can get a hotel room right there, roll out of bed and walk out to the race, and then head directly to the shower afterwards. The timing is really perfect too, because the marathon training plan basically picks up right where my Disney half marathon training plan left off. In fact, I'm already on week 7 of my 18 week plan! - An occasional bike and swim! I started running in 2009 as a way to get in better shape. I've met so many interesting people, heard so many stories, and recognized some of my own odd behavior in others. I've developed strong friendships and accomplishments through running, and created this blog to share my stories. I'm the proud mother of 4: A 14 year old Tennessee Walking Horse named Rocco, a 9 year old yellow lab named Toby, 1 skinny cat, and an 18 year old male human. Hyannis Half Marathon - oh wet fun! Iron Girl 2013 Race Report!